Compact design can be connected to the service valve using either a POL adapter or a Rego R Products pigtail. Ideal size fits easily inside of domes and collars. Large threaded 3/8" bonnet vent can be easily piped-away in underground installations without the need for glue kits or extra adapters. Non-adjustable negative direct acting design helps to keep regulator delivery pressures constant even as tank pressures drop. Negative direct acting design provides for excellent performance when needed most–in cold weather, when tank pressures are lowest and system demands are highest. Large 1/4" orifice helps protect against regulator freeze-ups. Built-in relief valve and travel stop comply with NFPA 58 overpressure requirements. 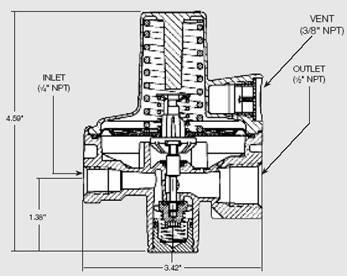 Incorporates built-in 1/4" FNPT downstream pressure tap for easy in-line checks of the regulator's downstream delivery pressure. Bonnet and body are assembled in the USA using the unique, patented RegULokSM Seal System. Ideal for use as a first stage regulator on any domestic size ASME or DOT container in propane gas installations requiring no more than 1,500,000 BTUs/hour. These regulators are factory set to reduce tank pressure to an intermediate pressure of approximately 10 PSIG.